Complementary feed for horses. Fibre Sensitive is a high fibre mixture, rich in fat with a low sugar and starch content for optimal gut health. This provides energy without any “heating” effect. 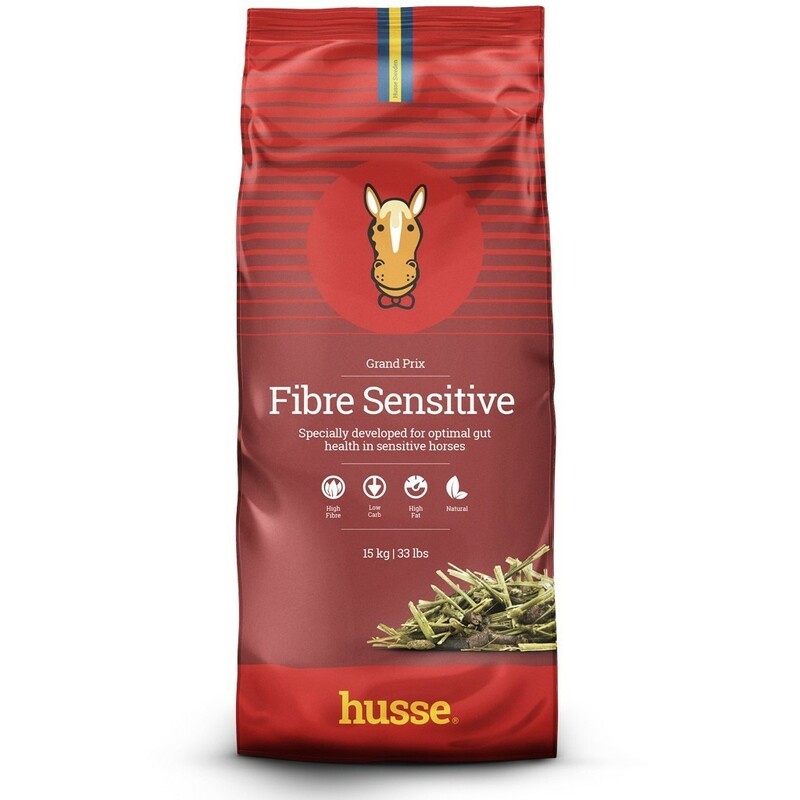 Fibre Sensitive is a natural product which is high in fibre (> 25 %), low in sugar and starch content (< 7 %) and has a positive effect on the bowel function. This feed is suitable for horses and ponies suffering from stomach ulcers, stomach and intestinal disorders, Cushing syndrome (PPID), insulin resistance, laminitis and, also, for nervous horses and ponies. FLAX CHAFF PELLET, ALFALFA PELLET - two types of extruded pellets rich in long fibres very beneficial to the digestive tract. ALFALFA STEMS - Long stem alfalfa encourages chewing and saliva production. The crude fibre in alfalfa is an engine for the intestines. 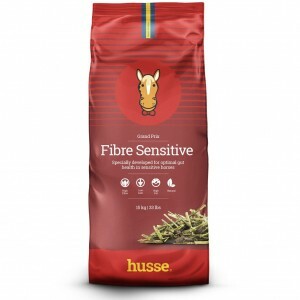 The crude fibre in Fibre Sensitive comes from high quality sources of cellulose such as alfalfa stems. Crude fibres also stimulate the production of vitamin B in the large intestine. Crude fibre is the indispensable pacesetter for the intestines and allows for a gradual release of energy. Alfalfa stems will slow down the passage of feed through the digestive tract and promote the digestion of all other ingested ingredients. EXPANDED FLAX SEED – EXPANDED VEGETABLES. Both nuggets are rich in long fibres. Together with the unique Fibre Sensitive aroma, they guarantee an excellent palatability. LINSEED OIL - high oil and energy content. Linseed oil provides energy without a “heating” effect. Starch causes the “heating” effect, as it is broken down rapidly into glucose. These sugars are absorbed very quickly, giving the horse a rush of energy. ACTIVE YEAST - Active yeast for a smooth digestion. Live yeast cultures promote acid-using bacteria in the large intestine and stimulate a healthy gut flora. It ensures an optimal efficiency of the feed. Yeast is an ideal support for a smooth intestinal passage. Yeast and hindgut: changes to the pH of the hindgut can occur when soluble carbohydrate, either from grains or grasses, overload the small intestine and pass to the large intestine where microbial fermentation occurs. Rapid fermentation occurs with accumulation of lactic and acid bacteria, which changes the pH of the hindgut, causing suppression of the fibre-digesting bacteria. Changes to the pH of the hindgut can cause colic, laminitis, and increased gas accumulation, as the abundant lactate- producing bacteria take over. Active yeast helps to overcome these problems. GALACTO-OLIGOSACCHARIDES, MANNAN-OLIGOSACCHARIDES, FRUCTO-OLIGOSACCHARIDES - GOS, MOS and FOS are prebiotics which are only used by benign bacteria and which promote their development and thus a healthy intestinal flora. BIOTIN - helps to improve hoof quality. Biotin is a member of the B complex group of vitamins and is best known for healthy skin, coat and hoof. Biotin is a vitamin that must be obtained either through the diet or via the absorption of Biotin that is synthesized by intestinal bacteria. MOLASSES: Molasses is a residual product from sugar production and contains up to 50 % sugar. It is used as a kind of ‘glue’ to obtain hard pellets. No molasses means no additional sugar. SOY: Soy, used in animal feed as protein source, contains mainly GMO soy. We want our Fibre Sensitive GMO FREE, so we don’t use soy. WHOLE GRAINS: to obtain low-starch and low-gluten, whole grains are not present in Fibre Sensitive. Whole grains are very rich in starch and some grains contain gluten. COMPOSITION: flax chaff pellet, alfalfa stems, alfalfa pellet, expanded flax seed, expanded vegetables, linseed oil, yeast, galacto-oligosaccharides, mannan-oligosaccharides, fructo-oligosaccharides, biotin. ANALYTICAL CONSTITUENTS: crude protein 10.0%, crude oils and fats 9.0%, crude ash 10.9%, crude fibre 25.7%, starch including sugars 6.9%, calcium 1.9%, phosphorus 0.4%, sodium 0.3%. ADDITIVES: Nutritional additives: vitamin A (3a672a) 14800 IU/kg, vitamin D3 (3a671) 975 IU/kg, vitamin E (3a700) 376 mg/kg, biotin 324 µg/kg, choline chloride (3a890) 405 mg/kg, E1 (Iron) 122 mg/kg, 3b202 (Iodine) 0.45 mg/kg, E4 (Copper) 42 mg/kg, 3b503 (Manganese) 68.52 mg/kg, 3b605 (Zinc) 135.24 mg/kg, E8 (Selenium) 0.4 mg/kg. Technological additives: E280 (Propionic acid) 0.56 g/kg, E284 (Ammonium propionate) 0.6 g/kg. Zootechnical additives: 4b1702 (Saccharomyces cerevisiae NCYC Sc 47) 4xE9 CFU/kg.